You might think that adding a species to your British list would be a simple matter, either find, or go and see a new species and then thats that. However there are a lot of grey areas; you might not see the bird well enough to be sure of its identity, or if you know its identity you might not be satisfied by the views. Taxonomy is another issue, checklists vary in how they treat different species, and some splits are flagged up years or even decades before they are acted on. Confirmed as a Stejneger’s Stonecaht by DNA analysis, but although the form is treated as a full species by the IOC it isn’t by the Clements Checklist or (yet) by the BOU. Perhaps the biggest problem in deciding what to count, at least in the UK, comes when there is a possibility that the bird in question might be an escape from captivity. Nowhere is this problem greater than with wildfowl, as escapes from wildfowl collections are far from uncommon. Emperor Geese occur only in western Alaska and far eastern Siberia and are only short distance migrants. occurences in the UK can definitely be ascribed to escapes from captivity. As a long distance migrant visiting the UK only in the summer, you might think that all Garganey would be wild birds, but one male seen paired to a female Mallard on the River Stour during winter was widely considered to be an escape. Manadrin Ducks (male left, female front) is an established introduced species and although its natural range is no closer than China, it is countable for your British list. However the American Wood Duck (at rear), although it breeds in the UK, is not established and hence not countable. 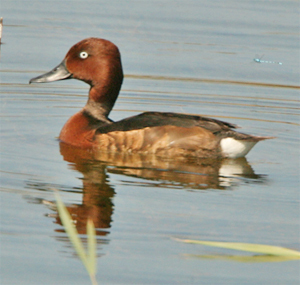 Ferruginous Duck may occur in captivity but a bird found in the UK is far more likely to be wild than an escape. But what do you do about the American Hooded Merganser? It is on the British list as a wild bird but escapes also occur. This drake was found exhausted near Portland a few years ago but recovered enough to fly to nearby Radipole. It was widely touted as a wild bird but it never left and became quite tame. Some still consider it of wild origin but most others disagree. I have seen this bird many times but was never sure about adding it to my British list. News of a female Hooded Merganser in West Sussex made me realise that I needed to see another one. This bird was a first winter, turned up in late autumn at a coastal locality and was reasonably wary; it seemed to tick all the boxes, (except for knowing whether it will take up residence for life). As a result on the 9th of November I headed to Pagham where I had good views. I have seen this species at least four times in the UK and as this one has the best credentials, I am adding it to my British list. The bird spent much of its time hiding on the edge of the reeds. I later headed for Farlington Marshes near Portsmouth where a Red-breasted Goose had been seen. This bird also can occur as an escape, but this bird was with Brent Geese (and probably migrated with them from Arctic Siberia), turned up in autumn and indeed was probably the same bird as I saw at nearby Keyhaven earlier this year. Brent Geese. The bird just left of centre is a juvenile, as shown by the pale fringes to the coverts. Geese often remain in family groups through the winter and the three left hand bird are probably a pair and their offspring. Adult Red-breasted Goose with Brent Geese. Other recent news – on the 7th we enjoyed a meal with our friends from the Nexus group at a meal at the Ferrybridge Inn in Poole. On the evening of the 9th we visited the vicarage for a Bonfire party and met up with some old acquaintances. .. and on the 10th we were going to see an American folk group called the ‘Civil Wars’ in Southampton with Gio and Jessica. However at the last minute the gig was cancelled. As we were all free then Gio and Jessica asked us round for a meal. « 4th November – the New Forest anniversary visit.